Photos + Recap: Deer Tick's Newport Folk Fest After Party - Newport, R.I.
On Friday night the stage at the Newport Blues Cafe was backed with velvety black, and was slightly twinkling with would-be chintzy stars, but not so on Sunday. On the closing night of 2013’s Newport Folk Festival, the backdrop was a counterintuitive sky blue, emblazoned with “Deer Tick” in the band’s signature font—the night belonged to them. The backdrop also mimicked their newly announced album art, which had been pulled across the sky by a plane the day before in a tongue-in-cheek stunt. 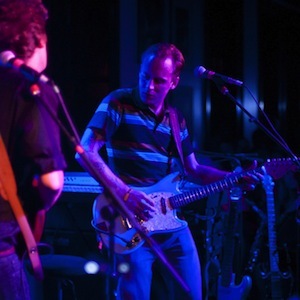 Although all three nights of the now infamous after parties are hosted and headlined by Deer Tick, on Sunday the band were set to play their fifth studio album Negativity in full, a feat that drew a packed house despite the weekend’s looming end. The Newport Blues Cafe is a perfect venue for the kind of raucous, feel-good and down-home shows that Deer Tick so dearly love to throw. It’s got a long and wide bar elevated on a kind of platform at the back, and plenty of floor space for crowding around the clunky stage that’s situated near the front door. The lip of the stage is low enough that the numerous musical guests the band bring onstage throughout the weekend can easily lope up and join, and the musicians that did that this weekend counted Phosphorescent’s Matthew Houck and Taylor Goldsmith of Dawes among their ranks. It’s these kinds of rare, back-room collaboration that make these shows special and gives them a feeling of community that is both intimate and unexpected in today’s often sterile musical climate. And despite the fact that it was Deer Tick’s full album that the band had planned to play, there was still a guest or two onstage before everyone said goodnight. After sound-checking to a mounting sense of excitement, John McCauley finally leaned casually to the mic and grins, “Ladies and gentleman, Negativity!” The first thing that struck right away on the opening song “The Rock” was the brass section. After John’s initial voice and guitar repeat the intro, the track broke into roaring full band support and a saxophone, a trombone and a trumpet were all featured playing at full volume. As the lead single for the album, most of the audience had probably heard this one before, but all that brass live was an experience in itself, and just the first hint of a new direction for the band. McCauley’s introductions between songs remained short and sweet, a little bashful almost. “Well that’s track one, how about we do track two ‘The Curtain,’” he said following the opener. This one was full of almost punk-sounding drums and guitars that all build to a climax before the lyrics even hit, and though the band has played loud guitar songs before, they never seemed quite as hard. The third song was a curve ball. Called “Just Friends,” it touches on the well-worn conundrum of how close two people who’ve gone past falling in love can get after it falls apart. It has the poignancy of an old country ballad in the footsteps of George Jones, and an earnest honesty that could almost come off as cheesy if McCauley’s smoldering voice didn’t bring it back from the edge of too cute. It’s his voice and persona that carry Deer Tick and always have, making them into something that’s more than an alt-country act, more than a bar band. For “The Dream’s in the Ditch,” McCauley mentioned that the band played it earlier at Paste’s own live video recording for Paste at The Ruins. And though Ian O’Neil’s voice and presence are strong, they’re no match for John. The same goes for the later played “Thyme” which was penned and sung primarily by drummer Dennis Ryan. Both tracks are strong and enticing, but they’re missing the charisma that McCauley effortlessly brings. “Mr. Sticks” possibly felt the most Deer Tick-ish of all the songs, although the heavy organ presence on nearly every track suggested religious-era Dylan or even, as my friend commented, that McCauley has been spending a lot of time with Taylor Goldsmith. Regardless of influence, the chimey, vintage organ sound—though keyboard-created—adds a depth and flair in all the right places, rounding out the sound and softening it a bit. For the next tune, though, there was no softening. “This is what someone called our Memphis show stopper. It’s called ‘Trash; and it’s about… shady stuff,” McCauley says before breaking into the swampy, scream-sung song. The brass opener for it is big and dramatic enough to be straight out of a Count Basie track, but McCauley manipulates the vocal lines back into the blues and rock vein. There’s lots of instrumental breaks in this one and the guy next to me in the crowd remarks to his friend “This is really different. Way different. I like it though!” This was what I was told about the album before hearing it, and, I agree with his assessment. It’s a step in a new direction for the group but it seems like a more classic album than many of their others. It takes itself more seriously and the result is somehow more fun in the process. This leads to what might have been one of the most fun moments of the whole night, when John asks his now-girlfriend Vanessa Carlton to come onstage to sing her feature on “In Our Time.” An adorable, old-age reflection on love, this one almost brought me to tears on some of the most heartfelt lyrics (I’m a crier). Apparently the pair met through Twitter, a 21st-century-style romance that seems almost too good to be true. It also led me to an interesting situation—I never thought I’d be yelling ‘Someone turn up Vanessa Carlton’s mic!” at a Deer Tick show. And so life goes even for musicians, they meet new people get new influences and make decisions that never seemed plausible even a few years or months before. It’s nice to see the band moving forward and growing instead of staying stagnant. For this album, McCauley and company are helping themselves to some true blue country influences, a trickle of jazz runs through several songs—and then there’s the moments when things get heavier. It isn’t an album that settles back comfortably into the armchair of alt-country. Rather the disparate influences reveal a band eager to build on the foundation they’ve already established, a willingness to wander down rabbit trails that pans out in all the right ways. “Hey Doll” is an example of this meandering, another ballad-like track full of strings and piano, and though McCauley claims he isn’t good on the keys, he actually managed them quite gracefully. The contrast between his rough and raw voice and the delicate piano and building strings just works, especially alongside some of the darker loudness this album contains. Nearing the end of the album, McCauley introduced “Pot of Gold” as a song “about crack cocaine.” The guitar riffs on this track were so heavy that the stage seemed to bend under their weight, and the weight of what the song stood for. There’s an aggression in this song that could possibly speak to the relationship McCauley has long been rumored to have to drugs—but instead of a celebration the song feels like a condemnation or a disavowal. Certainly, McCauley looked more lucid and slick than he has, well, ever. The savagely scream-sung chorus “SAVE ME” certainly suggested that autobiographical elements were present. Ending with a song called “Big House” that’s the closest the album comes to an acoustic jam, both the band and the crowd seem relieved that the album was out there. Playing for a crowd that’s never before heard the songs is tough for any band, but still, throughout the set the crowd was attentive. And while the reaction was positive, Deer Tick has always been a sing-along band. After Negativity was over, they burst into the opening lines of “Main Street” from 2011’s Divine Providence the entire crowd raised their hands to cheer. When they got to the anthem of “Ashamed” from 2007’s War Elephant, the crowd’s singing almost overpowered the band. This is a group that has a contingent, a phalanx of devoted followers, and as one of them I can say that the welcoming of Negativity into this well-loved canon can only be a matter of time. As for the rest of the after party, once the full album was played and the Deer Tick staple closers had been sung, there was only one thing left to do. The Felice Brothers hopped up on stage, Newport Folk Festival producer Jay Sweet was called up and the band played a nearly ten-minute-long brass-heavy, swaggering rendition of “Goodnight Irene.” It wasn’t a lullaby, but it sent us all out with a sense of security and sentiment: Newport Folk Festival, Deer Tick, and everything this music stands for are here to stay.